The Corbett Foundation Blog | Ujani Backwaters: A blessed wetland! The sun was slowly setting at the huge water reservoir appearing like a sea. The waters were calm with a pleasant chill in the air. The boat sailed nearer to the grassy muddy mid-lands and silently uncovered a beautiful picture, hundreds of flamingos with their slender necks pushed in feathers, egrets cautiously moving around them and an amazing reverie of Grey Heron. Suddenly flamingo flock starts walking in a direction, they walk together for seconds, then move little faster and take off with their fiery wings in a blink and we just sock ourselves in an experience without words. 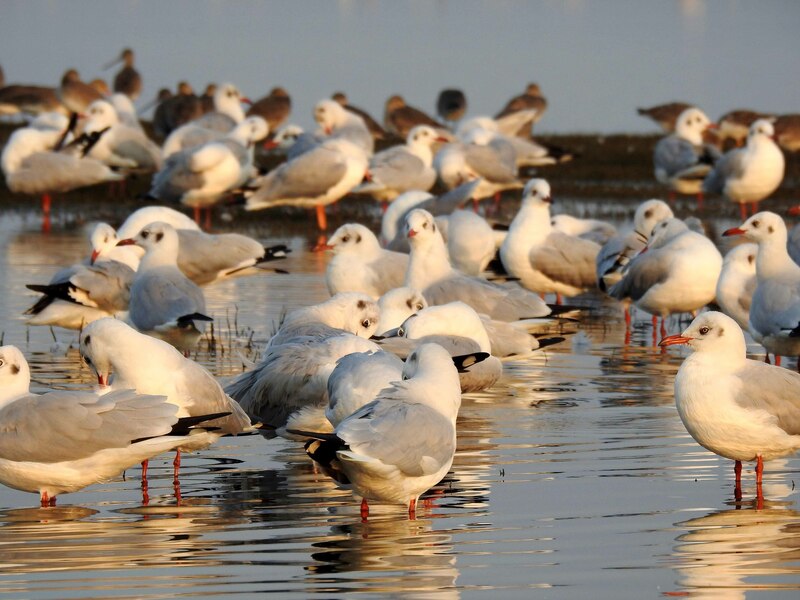 The Ujani backwater, a man-made wetland, is a winter sojourn of many migratory birds from India as well as outside and is a mesmerizing spectacle for birders. This reservoir is one of the largest backwaters in India created by Ujani dam. The dam was an irrigation project on Bhima River, a tributary of river Krishna and is located near Ujani village of Solapur district. The Bhima River that originates from Bhimashankar Wildlife Sanctuary of Western Ghats has 22 dams built on it and Ujani dam is the largest and terminal one. The reservoir has a gross storage capacity of 3.32 km3 fulfilling multiple purposes, irrigation to agriculture particularly in Solapur district, being the primary one. But it also has rural, urban and industrial activities that are equally consuming. It was a simple coincidence that we visited this picturesque wetland just before World Wetlands Day. 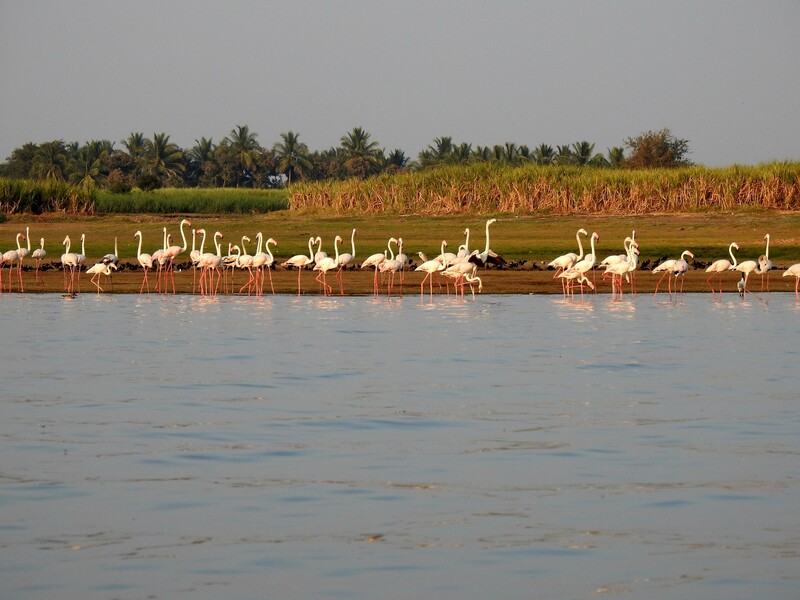 Presently India has 26 sites designated as wetlands of International Importance according to Ramsar Convention. 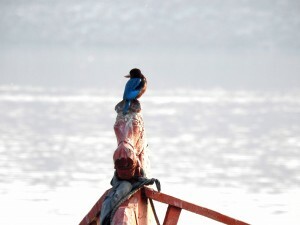 As far as Maharashtra goes, of its multiple natural and man-made reservoirs, none is designated so far as Ramsar site. 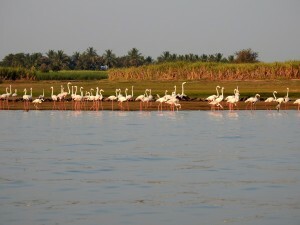 But according to Ramsar’s important identification criteria of population of migratory birds, Ujani backwaters is amongst the six important wetlands of Maharashtra hosting around 250 species of migratory and resident birds right from pied kingfisher, northern shoveler, bar headed goose, great egret, painted stork, Indian cormorant, Eurasian coot, common moorhen, black headed ibis, Asian openbill, the list is pretty long. 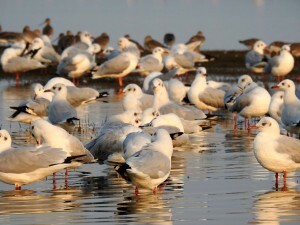 This year water level was little low with less rainfall and the birds had moved to the interiors of the reservoir. While the magical spring of flamingos of yester evening was still lingering on our minds, the foggy morning had an absolute different treat to our eyes. The flock of bathing birds was least bothered about the tourists. Flamingos looked like statues. Indian cormorant was peacefully drying his wings and the common kingfisher indifferently braved the morning chill on boat hood. 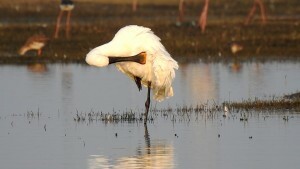 Spoonbill’s preening was a photographer’s delight and click-click just couldn’t stop. With such a blessed habitat with many species of flora and fauna, this wetland has tremendous benefits to the villages around. Sufficient water for agriculture, livelihoods to many through fishing and tourism, flood control and shoreline stability are some of the aspects, this wetland caters to. Though created strategically for economic development, today, if we value this water resource only as an instrument of economic growth, can invite damage not only to the ecology but to humans as well. The cash crops requiring huge irrigation, unmonitored use of pesticides, untreated and excessive sewage and industrial waste disposals, uncontrolled urban growth, changing mindsets of people for newer lifestyles are slowly and steadily affecting this huge wetland. Decline in the fish density in major tributaries of River Krishna, increase in exotic weed species in water are some of the indicators of quality degradation of the wetland recorded by researchers1. So this is not only the threat to habitat and its wildlife but has long term adverse effects on the present and future human population who is consumer of this wetland in whichever way may it be a food or water. The conservation management of such a large reservoir is not as simple as that. But judicious water usage for local, agricultural and industrial purpose, advocating advance irrigation technologies to avoid waste of water and banning diversions of water for non-priority purposes can be some of the large-scale measures possible with Government and people participation. Conservation awareness among the local communities for wetlands and its flora-fauna can help in a long run. On a smaller scale, villagers of Bhigwan, a tiny town situated at the banks of reservoir are doing their bit. Consciously avoiding plastic litter in water and lands, controlled fishing and adopting rowing instead of engines for tourist boats wherever possible, are some of their simple ways to ‘stop draining wetland’.